Hello everyone, Ivana here! I hope you are all having an amazing day so far! I just had a long day at school with test after test and decided it was the perfect time to sit down and write a little. 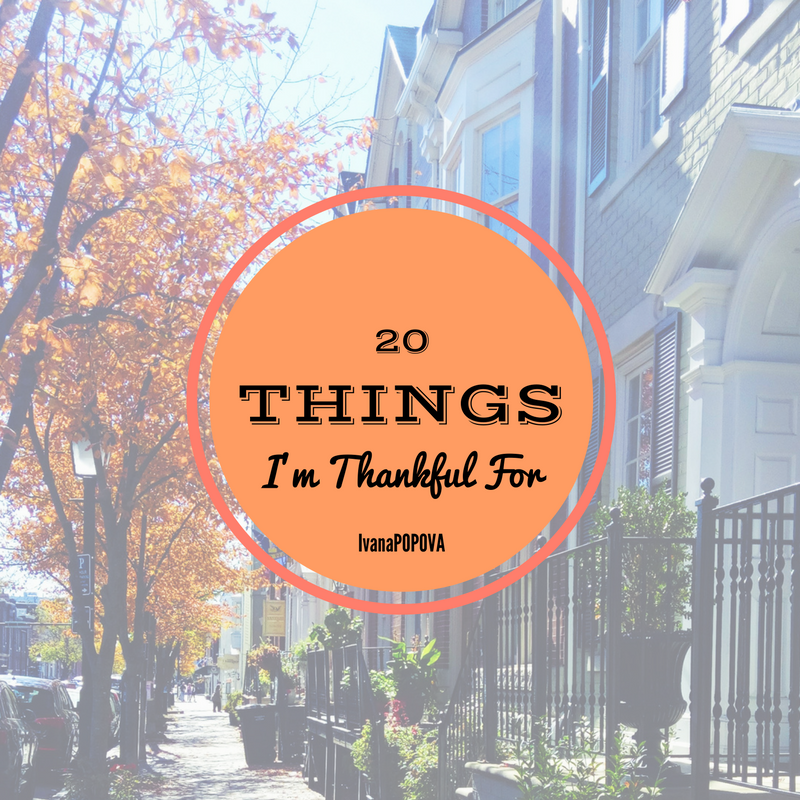 Recently on Instagram, there was a "20 things you're thankful for" challenge that really got me thinking..what am I thankful for? I thought about it, and easily came up with a list of 20 things. There's so much to be thankful for, and with Thanksgiving coming up I thought I would share my (very random) compiled list! My twin. Duh. Okay this one is obvious but it has to be my number one. All I can say is, a life without her just wouldn't be the same. I'm so thankful to have another half in my life whom I love with all my heart!! Shout out to my favorite!!! Meeting new people. This year, I have met so many new people, and no matter what role they play in my life (big or small) I am thankful for each and every one of them. Without realizing it, we learn so many things just by talking and sharing experiences with others. Fresh new perspectives and opinions are always welcome to me. Old music. Honestly no one can tell me that hearing an old favorite song is not the best thing. It is. A favorite old tune can bring back so many memories. I just made a Spotify playlist with all my old favorite tunes and now THAT is something I am thankful for, especially to rock out to in the mornings. Baking. More like eating half the bowl of whipped cream, cookie dough, or brownie batter before the finished product, but, baking nonetheless. Especially Thanksgiving Pumpkin Cheesecake. Mmm! Heels. Booties. All of it! Any shoe that gives me a little more height is an instant favorite! Happy days. The days that I laugh so hard I cry, those are the days to live for. TV shows that actually peak my interest every episode. Currently I am keeping up with the show "Madame Secretary." I seriously cannot recommend this show enough! Starbucks seasonal drinks. Yes, I give those slightly over-priced but very delicious drinks some love every year! Compassionate people. I have such a huge appreciation for kindness and anyone who is willing to help when needed, accept others, and exemplify the most positive, open, attitude towards people they meet. Those people make my day. Inspirational quotes. Whenever I have a bad day, I can always count on quotes that generate positivity to get me through the rest of the day. Conversations that matter. Sure, small talk counts for something, but the genuinely interesting conversations that bring meaning into my life are what I am most thankful for. Cuddling up in a sea of fuzzy blankets. With the weather getting colder, there is nothing I love more. Add hot chocolate, coffee, or apple cider to that and a truly perfect combination is made! My friends. I could write a pages and pages about how thankful I am for my closest friends. Find people that are supportive and encouraging in everything you do, you'll be so grateful! I know I am! A good book. I wish I had more time to read, but when I get the chance to do so, I am always thankful for the books I just cannot put down! What can I say, I'm a book nerd! Lazy weekends. Stress-free days where I can relax and take some time for myself are so valuable to me. They don't happen often, but I am definitely grateful when they do! Audrey Hepburn & old classic movies. Miss Hepburn is a huge idol of mine, as well as all the movies she acts in. I could live in a world of black and white with her! The beach. Hands down I am a beach girl. The ocean is my happy place. Tan lines, the salty breeze, warm weather, and waves crashing into the shore are all things that about equal perfection to me! My family. Yes, another cliche, standard answer, but one of the most important! I am so thankful to have a loving family around me! Even though only my immediate family is close to me, all the others scattered around the world, I can still feel everybody's love! I live for the smiles on my grandparents faces when I Skype them! Blogging. I remember deciding to start a blog a few years back. It used to be a different one, but I have been writing for a while now. Starting fresh, with this one, was one of the best decisions me and my sister made! We have been overjoyed to watch this blog grow and progress. I am thankful that, even in our busiest months, Kalina and I can find time to share new content with all our viewers! You guys!!!!! Kalina and I cannot even BEGIN to express how grateful we are for every single person that takes the time to visit our page! It is unbelievably fulfilling to watch our numbers grow, and see where all our viewers are coming from. I love seeing viewers from all over the world! It is one of the most rewarding things to see! Thank you all so much for bringing smiles to our faces! With Thanksgiving right around the corner, I wanted to express how thankful I am! For anyone who does not live in the United States, Thanksgiving is our national day of thanks here. No matter where you live, though, it is always important to remind yourself of what you are most thankful for! Making a list highlights that perfectly! Much love! 💭What are you thankful for? Awww...this is so genuine and heartfelt. I hope you have a WONDERFUL Thanksgiving! I'm thankful for the trials, triumphs, and for being alive & well!